In January 2018, Modern Water Plc. established into a joint venture with Northumbrian Water for the new Gibraltar wastewater treatment plant. It covers design and survey work required for final planning and environmental approvals as well as preliminary site works. Upon completion, Northumbrian Water is expected to be responsible for the operation and maintenance of the plant for 20 years. In March 2016, Modern Water Plc. signed a joint commercialization agreement with Advent Envirocare Technology Pvt. Ltd. regarding brine concentration technology for wastewater treatment in India. Furthermore, the company tested the all-membrane brine concentration technology that resulted in receiving one contract to the company for the textile dyes industry. Asia Pacific is estimated to emerge as one of the prominent markets for the brine concentration technology. Highly environment-conscious Europe and North America are projected to lead the global brine concentration technology market in the near future. The brine concentration technology market is projected to witness a large number of collaborations between manufacturers and technology developers during the next few years. The global brine concentration technology market is a highly competitive. Leading players dominate the market. Key players operating in the brine concentration technology market are Advent Envirocare Technology Pvt. Ltd., Modern Water Plc., Memsys Water Technologies GmbH, Enviro Water Minerals Company Inc., Oasys Water, TETRA Technologies, Inc., Fluid Technology Solutions, Inc., Osmo Membrane Systems GmbH, Saltworks Technologies Inc., Duraflow LLC., Veolia, and Synder Filtration, Inc.
Brine concentration technology entails treatment of the produced brine to remove harmful salts from the water. Brine is considered a high-concentration solution of salt. It is usually sodium chloride mixed in water. Brine is produced through various processes. It is a salt water solution, which may contain different salts such as calcium sulfate, silica, calcium chloride, and sodium. Brine needs to be treated before it is discharged into the environment. Brine concentration technology is likely to vary according to the end-use industry and quality of the produced brine. Implementation of stringent regulations related to minimization of harmful carbon emissions is propelling the demand for brine concentration technology. Increase in oil & gas activities and growth in other end-use industries have resulted in the production of brine in the environment. Therefore, governments of several countries are funding and supporting development and adoption of the latest technology in the brine concentration technology. Asia Pacific is estimated to emerge as one of the prominent regions of the brine concentration technology. Highly environment-conscious Europe and North America are projected to lead the global brine concentration technology market in the near future. The brine concentration technology market is projected to witness a large number of collaborations between manufacturers and technology developers during the next few years. This report analyzes and forecasts the brine concentration technology market at the global and regional level. The market has been forecast based on revenue (US$ Mn) from 2018 to 2026, considering 2017 as the base year. The study includes drivers and restraints of the global brine concentration technology market. It also covers impact of these drivers and restraints on demand for brine concentration technology during the forecast period. The report also highlights opportunities in the brine concentration technology market at the global and regional level. The report includes detailed value chain analysis, which provides a comprehensive view of the global brine concentration technology market. Porter’s Five Forces model for the brine concentration technology market has also been included to help understand the competitive landscape. The study encompasses market attractiveness analysis, wherein products and application are benchmarked based on their market size, growth rate, and general attractiveness. 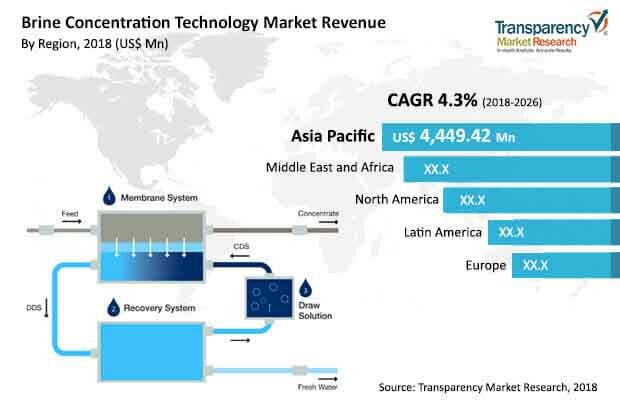 The study provides a decisive view of the global brine concentration technology market by segmenting it in terms of end-user industry, technology, and region. Based on end-user industry, the brine concentration technology market has been segmented into coal-to-chemicals, food & beverage, and landfill/leachate. In terms of technology, the brine concentration technology market has been classified into HERO, CCD, VTFF, MVC, and others. These segments have been analyzed based on present and future trends. Regional segmentation includes current and forecast demand for brine concentration technology in North America, Europe, Asia Pacific, Latin America, and Middle East & Africa. The report provides the actual size of the brine concentration technology market for 2017 and estimated size for 2018 with forecast for till year 2026. The global brine concentration technology market has been provided in terms of revenue. Market numbers have been estimated based on technologies and end-user industries of the brine concentration technology market. Market revenue and size have been provided in terms of global, regional, and country level markets. The global brine concentration technology market is a highly competitive. Leading players dominate the market. Key players operating in the brine concentration technology market are Advent Envirocare Technology Pvt. Ltd., Modern Water plc., Memsys Water Technologies GmbH, Enviro Water Minerals Company Inc., Oasys Water, TETRA Technologies, Inc., Fluid Technology Solutions, Inc., Osmo Membrane Systems GmbH, Saltworks Technologies Inc., Duraflow LLC., Veolia, and Synder Filtration, Inc. Market players have been profiled in terms of attributes such as company overview, financial overview, business strategies, and recent developments. Market share of the oil & gas end-user industry is estimated to increase in the next few years due to the strong focus on expansion in oil & gas activities. The oil & gas segment in the end-user industry segment is expected to provide a potential market over the forecast period. In terms of region, Asia Pacific holds significant share of the brine concentration. Countries such as China, India, Japan and Australia are the key countries providing significant market potential for brine concentration market over the forecast period. In China, HERO and VTTF segments held the large share in the by technology segment.